Think and Grow Rich - Over 80 Million Copies SoldThis edition of Napoleon Hill's Classic Think and Grow Rich is a reproduction of Napoleon Hill's personal copy of the first edition, the ONLY original version recommended by The Napoleon Hill Foundation, originally printed in March of 1937.The most famous of all teachers of success spent a fortune and the better part of a lifetime of effort to produce the Law of Success philosophy that forms the basis of his books and that is so powerfully summarized and explained for the general public in this book. 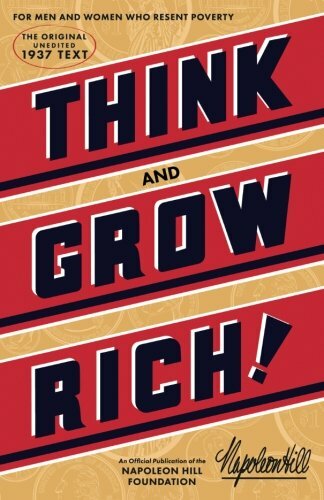 In Think and Grow Rich, Hill draws on stories of Andrew Carnegie, Thomas Edison, Henry Ford, and other millionaires of his generation to illustrate his principles. This book will teach you the secrets that could bring you a fortune. It will show you not only what to do but how to do it. Once you learn and apply the simple, basic techniques revealed here, you will have mastered the secret of true and lasting success. Money and material things are essential for freedom of body and mind, but there are some who will feel that the greatest of all riches can be evaluated only in terms of lasting friendships, loving family relationships, understanding between business associates, and introspective harmony which brings one true peace of mind! All who read, understand, and apply this philosophy will be better prepared to attract and enjoy these spiritual values. BE PREPARED! When you expose yourself to the influence of this philosophy, you may experience a CHANGED LIFE which can help you negotiate your way through life with harmony and understanding and prepare you for the accumulation of abundant material riches.